Apparently, the folks at Harpoon (in the Massachusetts division) are a bunch of Southies. So it makes sense they would have an Irish-style ale to go with the generally rampant pro-Ireland attitude in the area, which I assume for most is just veiled white supremacy. I wonder, though, what's the percentage of people in South Boston who can name the prime minister of Ireland? In terms of an ale I'm somewhat impartial to this, but it's decent. It's basic, but well crafted and nicely balanced. The taste seems a touch towards an English special bitter (ESB), with a faint metallic flavor that's, surprisingly, enjoyable. That's likely intentional, given the success of their 100 Barrel Series ESB. The burps from this remind me of a Coors Original--you know, the Banquet Beer--which brings back some powerful memories from college I though I'd managed to suppress. 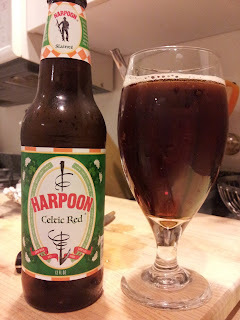 When I told her that Harpoon was an excellent east-coast brewery, the girl at Trader Joes was especially disappointed when she realized this was not, in fact, a beer from Ireland. "But it looks so Irish!" she exclaimed. "Your first clue should've been the lack of a Leprechaun or 4-leaf clover on the label." was my Jerk Store reply.